28mm angle of view used to be a representative wide-angle in the era of film cameras, and attracts many fans even today. To accommodate the request from many photographers who expressed the strong interest in using the familiar 28mm with Art line quality, SIGMA produces the SIGMA 28mm F1.4 DG HSM | Art, based on the know-how gained through development of the Art F1.4 prime lens lineup released so far. This newest traditional wide-angle lens, advantaged by the latest design and materials, as well as the processing technologies, is now available from SIGMA's Art line. This lens incorporates two FLD ("F" Low Dispersion) glass elements and three SLD (Special Low Dispersion) glass elements. In addition, it effectively arranges three aspherical lenses, including a large-diameter aspherical lens to provide thorough correction of magnification chromatic aberration -- encountered particularly in wide-angle lenses. This offers high resolution over the entire sensor, while sagittal coma flare is thoroughly corrected and distortion is also minimized to the fullest. Excellent performance is delivered in street photography, as well as shooting landscapes and night skies. * Function not available on all Canon cameras. Further, available corrections may vary by Canon camera model. Using the optional SIGMA USB DOCK, it is possible to adjust the MO position's sensitivity to switch to manual focus. Available AF mounts: SIGMA, Nikon F, Canon EF, Sony E-mount, (L-Mount TBD). 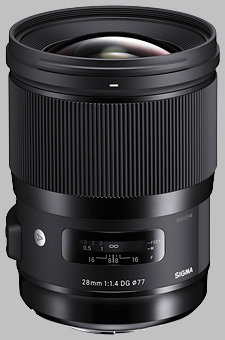 The Sigma 28mm f/1.4 DG HSM Art doesn't have any user reviews yet!